William Smith was born in Headington Quarry in 1889 and baptised at Holy Trinity Church on 29 September. His father was Wisdom Smith junior, who was born at Brailes in Warwickshire in 1854 and baptised at Charlton-on-Otmoor, Oxfordshire on 24 December and was the son of Romany people who had settled in Headington Quarry. In 1854 William's grandfather Wisdom Smith senior was described as a camp-travelling chair-seat flagger, but In 1857, a few years after the birth of William’s father he and his common-law wife Priscilla Bagley (also from a Romany family) settled in Headington Quarry, where (after having about ten children together) they eventually married in 1860. Wisdom Smith junior grew up in Quarry, and joined the army, serving in the 4th Oxfordshire & Buckinghamshire Light Infantry for eight years. William's mother was Harriet Tolley, who was born in Headington in 1854 and baptised at St Andrew’s Church on 14 May. Ernest James Smith (born in Headington Quarry in 1895 and baptised at Holy Trinity Church on 24 February). William's father Wisdom Smith junior was described as a “chairmender” at the baptism of his first child in 1879, but by the time of the 1881 census he was a bricklayer’s labourer (working for Mr Goodgame) and his mother Harriet was a laundress, and they were then living alone at South View in Quarry, their first baby having died in 1879. On 21 December the next year William’s father committed himself to another four years in the army, signing his name with a cross. By 1886 William’s father was working as a bricklayer's labourer back in Quarry, where William was born in 1889. On 4 June 1890 he rejoined the army for the militia only. The 1891 census shows William (1) living in Quarry with his parents Wisdom and Harriet and his three surviving siblings Samuel (7), Charles (9), and Harriet (4). William’s maternal grandmother, Mrs Ellen Tolley, was also living with them. William’s two youngest siblings, Harry and Ernest, were born in 1892 and 1895 respectively. On 7 May 1894 William’s father Wisdom Smith junior was dismissed permanently from the militia as unfit for service, and he died at the age of 40 in 1896. His death was registered in the Headington district in the second quarter of that year, but no one called Wisdom Smith was buried in either of the Headington churchyards or in Headington Cemetery. At the time of the 1901 census William (11) was still at school (almost certainly Headington Quarry National School) and living at Stiles Alley in Quarry with his widowed mother Harriet (47), who was working for someone else as a washerwoman, and his five surviving siblings: Charles (19) and Samuel (17) were working as brick merchant’s labourers; Harriet (14) doubtless helped her mother; and Harry (9), and Ernest (6) were at school. In 1911 William (21) and his younger brother Harry (19) were builder's labourers, living in Quarry High Street with their mother Harriet (57), who was still a laundry worker, and their youngest brother Ernest (16), who was a carter. Their siblings Charles (29), Samuel (26) and Harriet (24) were married and had left home. ♥ On 14 November 1917 at St Clement’s Church, Oxford, William Smith married Florence Mary Phipps of 8 Bath Square: he was described in the register as a Private in the Royal Engineers. They were married for less than a year, and do not appear to have had any children. In the First World War William Smith was a driver in the 105th Field Company of the Royal Engineers (Service No. 90915). He died of wounds in France aged 29 on 3 November 1918. He was buried in the Busigny Communal Cemetery extension (II.A.23). He is remembered on the stone plaque in the porch of Holy Trinity Church in Headington Quarry. 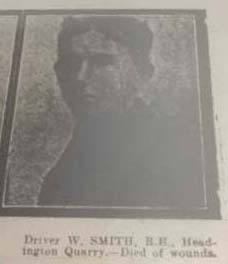 William Smith’s brother Harry Smith was also killed in the First World War and is remembered straight after his brother on the Quarry plaque. Three of his second cousins were also killed in the war: John Tolley of Quarry and George Tolley and his cousin Arthur Tolley of St Andrew’s parish. They were all descended from Samuel Tolley, who married Sarah Turner at St Andrew’s Church on 12 October 1812. Mrs Harriet Smith died at the age of 68 at Hill House (a home for the elderly at Sandhills) and was buried at Holy Trinity churchyard on 28 November 1923. Mrs Florence Mary Smith remained at the home of her father, the labourer Dennis Phipps, at 8 Bath Square, St Clements. Charles Frederick Smith (born 1881), a labourer living in New High Street, married Emily Louisa Matthews at St Nicholas's Church, Old Marston on 14 May 1910. At the time of the 1911 census they were staying with Emily’s mother and brother at Cromwell Castle, Old Marston. The birth of their daughter Gwendoline W. Smith was registered in the Headington district in the third quarter of 1911. Samuel Smith (born 1884) married Eliza Webb in the Headington registration district in the fourth quarter of 1907. At the time of the 1911 census they were living at Green Edge Lane with their first two children. They had nine children baptised at Holy Trinity Church: Thomas William Smith (born 10 June 1908, bapt. 26 July 1908); Vina Smith (born 23 February 1910, bapt. 29 May 1910); Muriel Smith (born 16 January 1912, bapt. 7 April 1912); Mabel Charlotte Smith (born 5 January 1914, bapt. 31 May 1914); Ernest Smith (born 4 May 1916, bapt. 30 July 1916); Harriett May Smith (born 12 May 1919, bapt. 15 June 1919); Basil Smith (born 23 February 1925, bapt. 3 May 1925); Sheila Barbara Smith (born 10 April 1928, bapt. 20 May 1928); Harry Smith (born 4 January 1923, bapt. 4 March 1923). Harriet Ellen Smith (born 1887) married Jesse Hooper in the Headington registration district in the first quarter of 1908, and at the time of the 1911 census they were living in Quarry High Street with their first three children, but by 1923 they had moved to 23 Pitts Road. They had eleven children baptised at Holy Trinity Church: Winifred May Hooper (born 4 November 1908, bapt. 27 December); Charles Thomas Edward Hooper (born 22 November 1909, bapt. 30 January 1910; Stanley Francis Hooper (born 17 March 1912, bapt. 26 May); Thomas William Hooper (born 15 August 1913, bapt. 26 October); William James Hooper (born 10 August 1915, bapt. 31 October); Jesse Hooper (born 24 March 1918, bapt. 19 May); Frederick Harry Hooper (born 10 June 1919, bapt. 17 August); Frank John Hooper (born 14 May 1921, bapt. 10 July); Betty Annie Hooper (born 26 January 1923, bapt. 1 April); Jean Edith Hooper (born 23 September 1924, bapt. 18 January 1925); and Eric Norman Hooper (bapt. 10 November 1926).